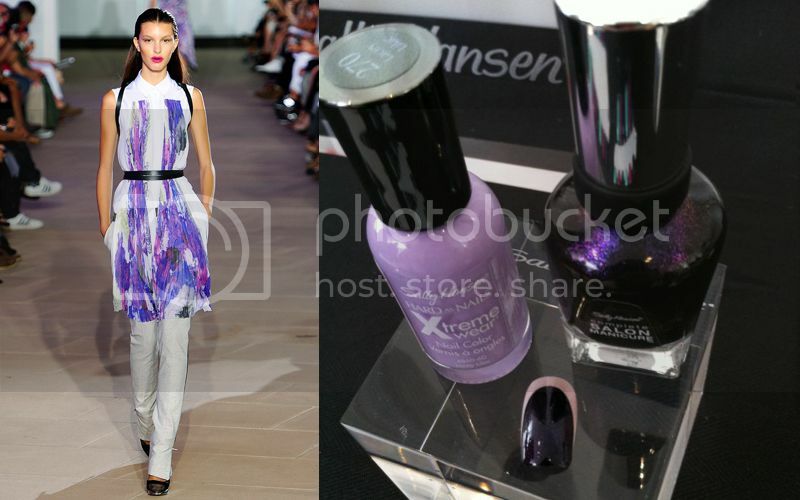 Sally Hansen has been making a very strong case for being the most fashionable nail polish brand. For Spring 2012 they continued their designer collaborations with Alexander Wang, Prabal Gurung and Tracey Reese; some of the most talked about shows of New York Fashion Week. So far this season there isn't a hotter designer to align yourself with than Prabal Gurung and the iridescent purple shade that they created together is just as buzz-worthy. Wang went for surprisingly subdued versions of patriotic red, white and blue while Reese opted for juicy brights. Overall a hugely fun success and I want them all. **If you don't know, Sally Hansen Complete Salon Manicure has the best consistency of any drugstore nail polish. I highly recommend trying it. I LOVE those first ones! I wish I could do it myself. So fun. I worked for SH for just over a year. The designer collabs are so much work but such fun. I am so excited to see that they got Alexander Wang this year... major!! Congrats on your Lucky FABB nom - super exciting.